Following the bloody crackdown in August, Egypt's Third Square, a movement opposed to both religious and military rule, is debating the path forward and experimenting with new tactics. In coffee shops and apartment basements in the Cairo night, activists from the Third Square movement are at work. Squeezed between a military clearing all obstacles to its rule and the Muslim Brotherhood, enraged by its swift removal from power in Egypt, revolutionaries who oppose both are counting their numbers after violent eviction from the streets. The Third Square is one of these movements, composed of revolutionary activists who came together to resist the country’s turn from revolution to civil strife following the mass demonstrations of June 30 against the rule of Mohamed Morsi and his Muslim Brotherhood. Since the Egyptian military’s bloody dispersal of Muslim Brotherhood protesters in mid-August and a curfew instituted since, Third Square has been forced into retreat. The movement’s future will have much to tell onlookers about the state of the Egyptian revolution. 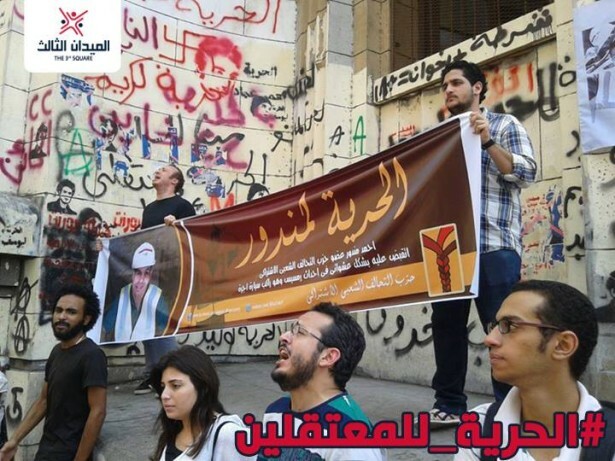 The young movement calls itself the Third Square because it deems itself the inheritor of the 2011 revolution and rejects what it sees as a reactionary religious order which, before being dispersed, was headquartered in Cairo’s Rabaa El-Adawiyya Square and a pro-military movement that had made its home in Tahrir Square. The night of July 26, in Giza, a protester from the Third Square movement climbed up on the pedestal of a statue of renowned writer Naguib Mahfouz. With megaphone in hand, he shouted “Down with the Brotherhood, down with military rule!” Three hundred protesters arranged in a semi-circle around the statue echoed the slogans, nearly drowned out by the roar of traffic on the bridge above the square. Just across the Nile in Cairo’s Tahrir Square, tens of thousands of pro-military demonstrators, heeding El-Sisi’s call to “fight terror,” dominated the attention of foreign media, waving banners with the faces of El-Sisi and former Egyptian president Gamal Abdel Nasser. Parents handed their small children up to smiling soldiers atop tanks for photographs. In Tahrir on July 26, there was no room for talk of the long history of the military’s repression of popular movements in Egypt, nor of whether it’s appropriate to categorically label all Muslim Brotherhood followers “terrorists,” whatever the organization’s offenses. “We see that the steps being taken by the current government are bringing us back to a pre-2011 state,” said Hassan, warning that the current Egyptian government, backed in large part by the country’s most powerful institution, the military, is doing all it can to contain the revolution’s radical current. “This term ‘terrorist’ is being used for anyone. Women wearing the hijab are called ‘terrorists,’” Ghadeer Ahmed told me in a café in Mostafa Mahmoud street, where battles between protesters and riot police erupted following the 2011 uprising, and political slogans and the martyrs’ faces decorate the walls. Ahmed is referring to the anti-Islamist rhetoric spouting from television stations, newspapers and official speeches since the ouster of president Morsi on June 30. “El-Sisi didn’t gather people to fight terror, but to keep him in power,” she said. Rizq pointed out that the repression of opposition groups has forced Third Square to withdraw, and precipitated a debate on methods of protest between its members. He said, “Some of the Third Square activists were convinced that we had to go out [into the streets to protest] no matter what the cost.” Others, like Rizq, don’t see the benefit of facing more brutal crackdowns in the streets. “We need time to rearrange ourselves, to find new tactics,” he told me. In the gloom of silence falling over Egypt, Third Square activists have had to take a step back and regroup. Unable to protest openly in Egypt’s streets without the threat of violent repression, Third Square is searching for new strategies. “If there is any way for us to go out and change people’s views, we will do it,” he said. “We have queues of people standing in the street holding banners with [anti-military] slogans,” said Rizq, noting one tactic Third Square activists are now using to avoid being labeled by the authorities as violent to justify a crackdown. Indeed, with the military-imposed curfew still hanging over the usually lively streets of Cairo and other Egyptian cities at night — as well as tanks stationed in most public spaces — other activists have searched for a way to protest and forge solidarity. Masmou3, a nascent online campaign that connects those who reject the rule of the military, the Brotherhood and the interim government, is just one example. It has asked supporters to bang pots and pans from their windows and balconies every night at 9 p.m. to show defiance to the new regime, and to “like” its Facebook page to show solidarity.